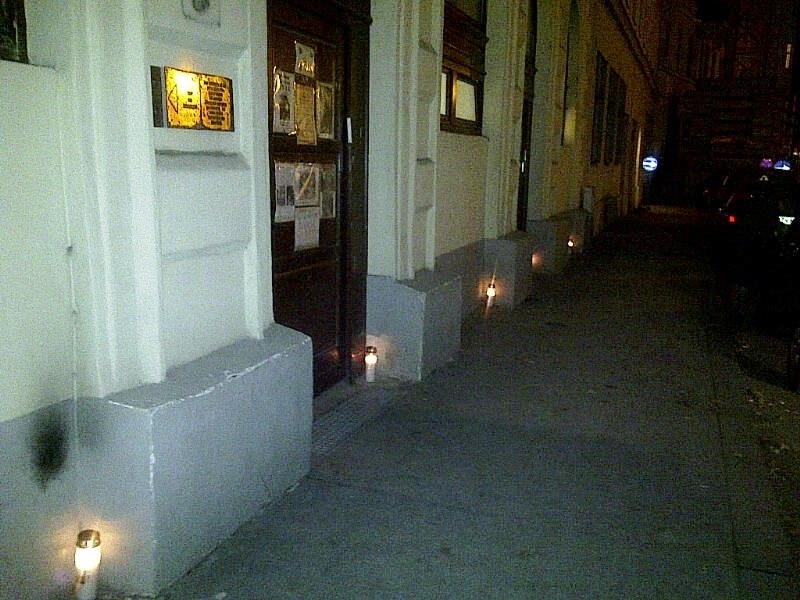 Jewish Prayer House in Vienna’s 2nd District on November 10, 2014 with candles in remembrance of Kristallnacht 76 years ago. Perhaps you’ve read about the Lichtgrenze (border of lights) created by artists Christopher and March Bauder and 8000 balloons released into the night sky of Berlin this past Sunday in commemoration of the fall of the Berlin wall. What perhaps didn’t make it into the international newspapers and online reports was an equally riveting show of lights into the sky commemorating another dark chapter of European history – Kristallnacht. This past Sunday evening, November 9, rays of light originating from various points throughout Vienna’s Leopoldstadt (2nd district) stretched high into the night sky and marked where synagogues and Jewish prayer houses once stood before they were destroyed and sent aflame during the Kristallnacht campaign of violence and destruction on November 9 and 10 in 1938, 76 years ago. The solemn vigil was an initiative of the Israeli Kultusgemeinde. In Vienna 42 synagogues and prayer houses were destroyed and of the 6547 Viennese Jews arrested, almost 4000 ended up in the concentration camp Dachau.